After a Tuesday night summit with Minnesota Timberwolves head coach and team president Tom Thibodeau, Jimmy Butler has officially requested a trade, per Jon Krawczynski and Shams Charania of The Athletic. Jimmy Butler has requested a trade from the Timberwolves, league sources tell me and @ShamsCharania. Butler has given Minnesota a list of 1-3 teams with which he is open to signing a contract extension. Soon thereafter, ESPN Bureau reporter Stefano Fusaro came in with a bombshell for #HeatTwitter. And then Five Reasons Sports’ co-founder, Ethan Skolnick, confirmed the report. Did we really just speak this into existence? Just confirmed the same as @FusaroESPN … the Heat are on Jimmy Butler’s list. After collectively exploding for a few minutes, Adrian Wojnarowski of ESPN popped the Heat fans’ balloons, reporting Miami actually was not on the initial list of teams Butler prefers. Minnesota’s Jimmy Butler has three preferred destinations for a trade, league sources tell ESPN: The Brooklyn Nets, Los Angeles Clippers and New York Knicks. Those three teams have max cap space to sign Butler as a free agent in July. It seems clear that Butler and his camp are doing everything they can to make sure he gets the full five-year max next summer when Butler becomes an unrestricted free-agent. All three of the aforementioned teams are expected to be teams with cap space. Many have speculated Butler would want to team up with his friend Kyrie Irving, who is also a free agent next summer. As much as it pains me to say this, I think I can confidently proclaim that Irving is in a much more desirable situation than Butler, who reportedly had chemistry issues with the T-Wolves all year. Former Timberwolves guard Jamal Crawford, who was a part of that locker room last season, confirmed as much recently. Like some have pointed out, other stars in recent times, specifically Irving and Kawhi Leonard, with preferred trade destinations have ended up somewhere outside of their original wish list. It is easy to see how Thibodeau, based on his history and also the type of moves he’s made since taking over in Minnesota, would want to trade for win-now pieces now that the air has been cleared with Butler. The Timberwolves are also in an undesirable spot because Butler only has one year left on his deal, and Minnesota is capped out due to some extremely questionable contracts given out over the past couple of seasons. Andrew Wiggins has four years left on his $150M contract, Gorgui Dieng has three seasons left at just over $15M, $16M and $17M, respectively. Jeff Teague has one season left at $19M with a player option. Not to mention, Thibs traded the pick that turned out to be Lauri Markkanen, along with Zach Lavine and Kris Dunn, for Butler last summer. They can’t just let him simmer and allow him to walk next summer, can they? With Dwyane Wade locked in for #OneLastDance, we should all be expecting Miami Heat President Pat Riley to get in his bag and be aggressive in trying to pounce on the disgruntled Butler, who is a close friend of Wade’s, especially since playing together in Chicago. And both our sources, as well as Five Reasons Sports’, are saying as much. The @MiamiHEAT are pursuing a Jimmy Butler trade with Minnesota, sources tell @miaheatbeat. Hassan Whiteside was walking on eggshells with the Heat for months last season. Everything came to an unfortunate climax in the playoffs when Whiteside was routinely held out from important minutes after being a net negative for the team whenever he stepped on the floor. With that being said, Thibodeau made his name in the league as a defense-first sergeant. Karl Anthony Towns, despite some improvement in the second half of last season, was ineffective on that end. 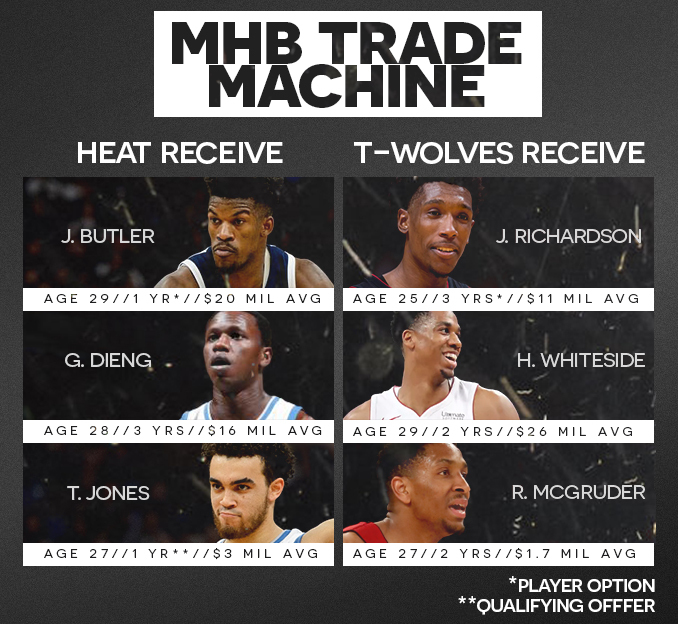 So it’s easy to envision Thibs wanting to bring in Whiteside, an actual rim protector, while also bringing in Josh Richardson who was barely left off of the All-Defensive Second Team and very cheap two-way depth in Rodney McGruder. Spin: This trade feels most likely in my eyes to happen. 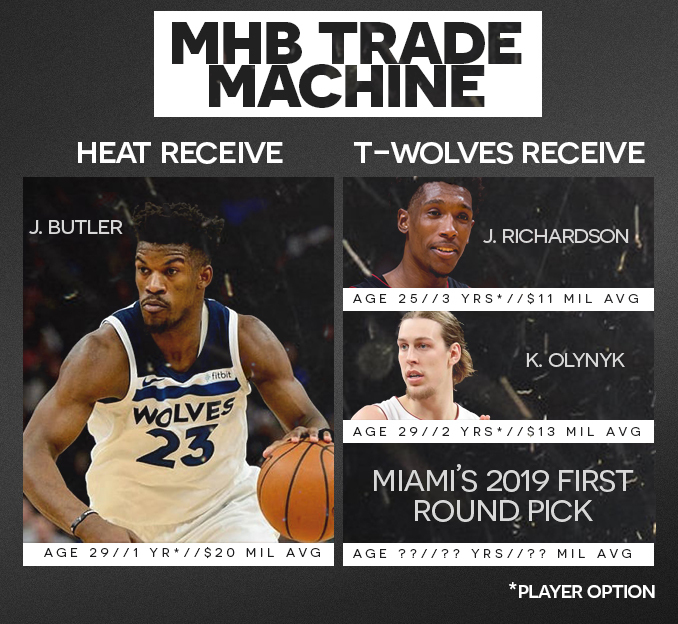 Timberwolves get an elite defensive wing with a blossoming offensive game under a good contract and at least two more productive years of Kelly Olynyk, who has impressed with Miami last season. The Heat are also armed with first-round picks to give out. 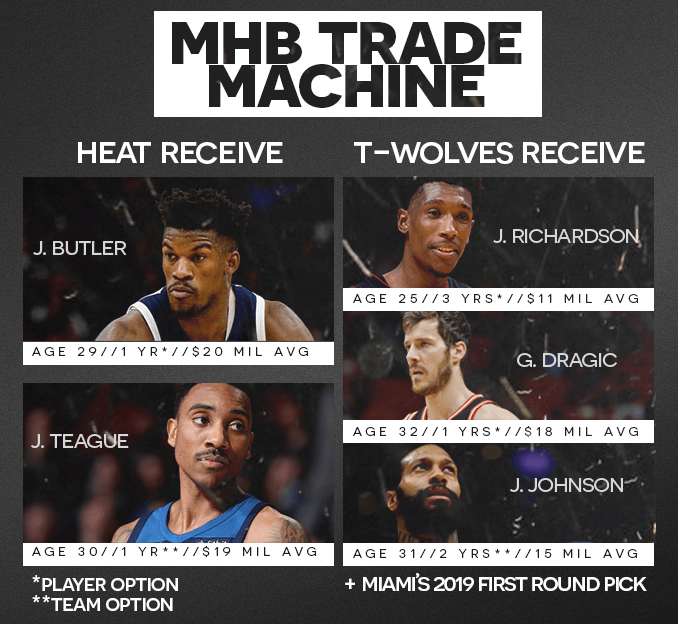 Spin: Minnesota would swap point guards with Miami and get an upgrade, add Josh Richardson, as well as James Johnson, who when healthy was one of the best perimeter defenders in the league and a Sixth-Man of the Year candidate. Rich doesnt have a player option..